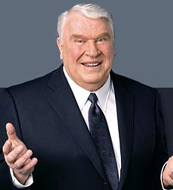 John Madden will join NBC a game analyst on Sunday Night Football. The network has scheduled an afternoon teleconference with Madden to make the announcement. Madden, who has spent the past three seasons teamed with Al Michaels on ABC Monday Night Football, will join NBC when it begins televising NFL games in 2006. He will now have been employed by each of the four major networks: CBS, Fox, ABC and NBC. No word yet on the future of Michaels, who is reportedly demanding ridiculous perks in a new contract. TNT's has struck it big with Kyra Sedgwick's The Closer. Its debut Monday night grabbed 7.0 million viewers, making it the most cable watched non-sports show of the year and puts it among the most watched cable series premieres ever. This season's previous high water mark? Also a TNT offering, last week's Into the West. Is Your Hurley Fatsuit Ready For The Convention? Look out, Trekkies: there's a new band of obsessed fans in town. Lost fans are organizing- and have held at least one convention to celebrate the show so far. Nearly 800 devoted fans coughed up nearly $200 each in Burbank last weekend for the opportunity meet some of the show's stars, writers and producers. The event was organized by a company that knows how to cash in on the passions of fanboy geeks: they also run fan gatherings for shows like Xena and Star Trek. * The rear section of the plane will be found, along with additional survivors. * The characters will finally find out what's inside the hatch. * The people in the finale who kidnapped Walt were indeed the "others" on the island. * The airliner did not crash by accident. Veteran TV journalist Geraldo Rivera has re-upped with Fox News Channel, sources said Tuesday. He will continue to be a correspondent-at-large and host his weekend show. Rivera has worked at Fox News since 2001, when he joined the channel as a war correspondent. Sci Fi Channel will show reruns of the 14 episodes of Firefly, the short-lived Fox series from Buffy creator Joss Whedon. The show will begin airing on the cable channel in July just before the release of Serenity, a feature film is based on the series. It's guinea pig TV: Super Size Me's Morgan Spurlock goes tube with 30 Days, where people agree to live in different environments for 30 days. Morgan Spurlock, the mad genius behind the jaw-dropping documentary Super Size Me, debuts his new series 30 Days tonight on FX. The format will be similar to his hit flick: his subjects will live a month of their lives immersed in various adjusted lifestyles and chronicling the (hopefully shocking!) results. It's a shame his movie hasn't had a bigger effect on fast food TV advertising. Sure, McDonald's announced last week that their commercials will feature a healthier Ronald McDonald. Everybody's favorite burger shilling clown will henceforth be known a fitness guru, purportedly to make him more kid friendly. This, they insist, is part of their effort to curb child obesity. Ha! He's still a clown, and he's still appearing in McD's ads! Sure, adults know clowns are actually creepy and disturbing, but kids still love 'em. I'm not sure how Ronald kicking around a soccer ball on a lawn in front of a McDonald's drive-thru is somehow that much more positive for kids. And I don't see the Happy Meals, complete with shiny plastic toy, going the way of the McDLT anytime soon. McDonald's is at least giving the appearance of making an effort. Carl's Jr. has a half-naked Paris Hilton serving up Six Dollar Burgers in a sudsy new ad. Number of calories in a Six Dollar Burger? 960! That's a tad worse than the also heavily advertised Wendy's Triple With Cheese (850 calories)- and the rotting corpse of Dave Thomas doesn't even give us a hott, Hiltonesque chick in the commercial to help us sweat out the fat. Still, at least Carl's and Wendy's aren't trying to job us by handing pig-tailed Wendy (clearly a lesbian) a lacrosse stick or putting the smiling Carl's star on a Stairmaster. They treat us Americans like we deserve to be treated: like mildly intelligent, fat, dumpy bastards. So please pass the ketchup, Ronald. And if you can stop adjusting your athletic supporter long enough, would you super size me, please?